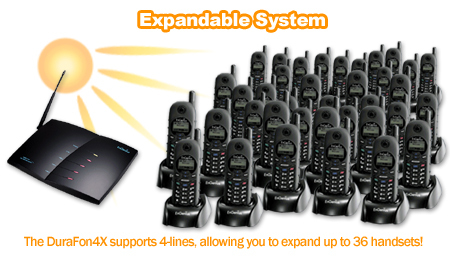 The EnGenius DuraFon 4X is the longest range cordless phone on the market. The DuraFon 4X provides 2-way radio or brodcast between handsets, independent of the base, and its 4-lines allows you to expand up to 36 handsets. The DuraFon4X is the newest generation of Industrial Cordless Phone Systems EnGenius has invented. 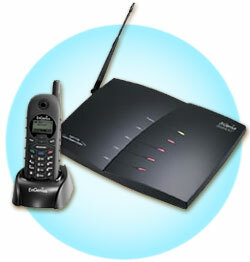 The DuraFon4X has the longest range avaliable in a phone system. 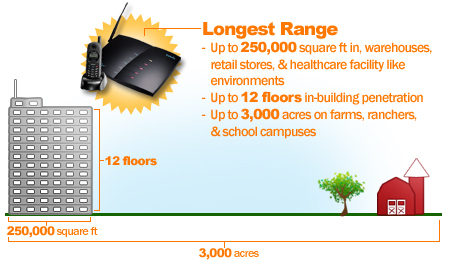 Reach up to 250,000 square feet in manufacturing plants, warehouses, retail stores, and healthcare facility like environments; 12 floors in-building penetration; and 3,000 acres on farms, ranchers, and school campuses. The two-way-radio is independent of the base and allows intercom and brodcast signals. You can even program your handset by individual base unit to receive all calls or just transfer. The system can also expand along with your growing business. With its 4-lines you can add up to 36 handsets. The DuraFon4X carries more features like the Caller ID with call waiting, digital spread spectrum with frequency hopping, multi-line, 30-number speed dial and much more.